Motova: So I came to this factory in 1961, and I never regretted it, because all my life was spent here, thirty four years I have worked, and even now I'm proud of it, because it is the first state ballbearing factory, and it is like my family. We make these nuts, from very small ones to two metres in diameter and a few tons in weight, we produce them not only for the Soviet Union, but also abroad, to one hundred countries abroad. They are always considered the best quality and we produce such a variety. Q: You worked according to five-year plans set by the state? Motova: How can you work without a plan? We've always had a plan. Well, it was based on reality, on how much equipment we had and how much we can produce. We also competed the social competition held to people to improve the production. And you have to know how many nuts should get used for this or that plant. Of course, we also had people who worked better than others, we had those brigades, those Communist teams, and we said what we could do extra and everyone tried to do more. And this was a socialist competition, and everyone could see who worked better and who was the best. I initiated the competition for implementing the five-year plan ahead of the schedule, and I was not alone. My friends supported me, and so we worked and we were happy. I am glad to say that my life was exciting, and when the competition was over and the results were announced in the Palace and we were awarded medals and orders and banners, we were all very happy. Q: How were you named a Hero? Motova: Well, we made the different details of nuts, and I had to do seven hundred details a day, and I did a thousand and even more, one hundred forty or one hundred sixty per cent. And I was awarded this title after the five year plan was implemented ahead of schedule... When I was awarded the title of the Hero, I was happy of course, and I was also happy that our factory was elected and that a woman was elected, because most heroes were men and I think it was the achievement of my factory. I couldn't have done it but for the support of the factory, of all the people. And it also showed how important the factory was and it became famous all over the country. Q: You were very proud of your work. Motova: I am from a worker's family, and it's our life and our government and our Party.... We were taught to work from childhood, and our factory helped many schools. The school children came here, and I told them about the factory, about my machine and about the nuts and how they are used in industry. Trains and planes and everywhere that there are nuts, they come from this factory. And we have our own professional school, and the graduates come here to work. On the first of September, which is called the Day of Knowledge, our workers went to schools, to vocational schools. 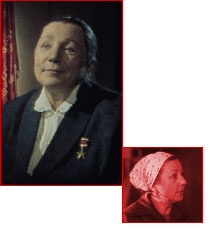 The most famous people who were awarded with medals and orders went to schools and told the children about our factory. The lessons were always exciting, and we were always proud when we spoke to them. We were proud of the young generation, and I think this was a great achievement of this country and of the government. Q: What were the big demonstrations in Red Square like? Motova: The most important celebration was the birthday of our state [in October], and we prepared long beforehand. [Our] plant, when we demonstrated in Red Square, almost always came first, because our district of Moscow and our plant was always considered to be very good, and you can imagine how proud we were. Every year that I worked here, I demonstrated, not because we were told to go, but we wanted to go, we were happy.... Now early in the morning, about seven o'clock, we gathered here near our plant and about twelve we were in Red Square, so it was five hours walking across Moscow, singing songs with music, and I loved those celebrations.... We sang songs, and we carried banners with slogans and flowers and pictures, and there was music, and there was the atmosphere of the celebration. It was an occasion to meet such a lot of people. We were excited, because we were going to see our leaders live. Well, I had some opportunities to meet them, but most people only saw them on TV and now they were excited and felt that they were the center of attention. There were beautiful parades, you can't describe it without excitement. When we approached the bridge and the parade was coming to an end and we saw those machines passing, we were so proud that our country was so powerful. And we felt like we were part of the country, and sometimes we were shown on TV, and they showed all the cities, the capitals, and everyone was happy and proud. And all the hearts beat for the same reason and everyone was excited and I can't describe it, we were so happy. We always expected and looked forward to those celebrations. We didn't just demonstrate. We prepared presents and our presents were our work, the results of our work. I shall never forget those demonstrations, and if somebody saw those demonstrations, they will never forget this happiness. You can't make people smile if they are not happy, and we could see that they were smiling, laughing and happy, and they brought their children, even if it was cold. You couldn't make people laugh if they were not happy. Q: What did you think about Perestroika? Motova: You know, there are many good things, the results of this Perostroika. But I belong to another generation. I am not a new Russian, I am an old Russian, and in those times, people hoped and believed that their future would be good, and they didn't think of bad things. Many people received flags from the government, went to vacation homes, and the children went to Pioneer camps, and now we only have half of those things, and people used to be sure of their future. Everything was free. You could study free, you could have a flat free, and if a young man came to our factory, we could always help him, we could see to it that he should study, that he should graduate, and that he should get qualifications and they knew that they were being supervised, controlled. And when we were ill, all the medical aid was free and so we could afford everything. Well, I'm not saying that everything is bad. We now have two holidays a week and we have long summer holidays, always in summer. Before Perostroika, we couldn't have such long holidays in summer, now we have twenty four days. Of course it's better than before. So there are good things, but many of the good things we had then, too. Q: How do you feel about the breakup of the Soviet Union? Motova: I will say that it always hurt. Even when I heard the Soviet Union anthem and I hear the words, I feel like crying, I feel like crying. We were all brought up in the same ideology. Even if we all have separated, the Ukrainians and the Kajiks, we were still the Soviet Union. We never thought about it. It was one country and one state, and I don't believe that after so many years, we can forget the friendship and the respect to each other. It will all come back. When we watched our sportsmen on television and saw our flag rising and heard our hymns, we always felt very proud for the Soviet Union. And now when I see somebody from the CIN [Commonwealth of Independent Nations], I don't believe they are foreigners. I feel they are part of the Soviet Union. Q: How do you feel about the fall of the Communist Party? Motova: Even now I can't believe in it. I could never understand how it could have happened, this strong productive Party, and suddenly it didn't exist any longer. My party committee just told me that they were closing. Q: Do you miss the old days? Motova: Now I feel that everything will be OK, and that people will understand that we had achieved so many good things. If they now say we have unemployment, [we say] we never saw unemployment before. Everyone was sure that if he didn't like his job, he could find another job... Everyone was sure for his old age and they knew they would have pensions and they would have enough. And now our old people are the poorest and it hurts very much.I am a pensioner, but I go on working, and I am ashamed and very sorry for the old people, because they deserve the good life really, and they are humiliated. Q: What was it like for you to watch the flag of the Soviet Union being taken down for the last time? Motova: When I watched it going down, I thought it was my life going away. I felt the ground slipping from under my feet. I cried tears of despair. How could this be happening? Maybe we Communists did make mistakes, I'll agree to that. But did they need to ruin everything? Not like that.It was our history. And now it was no more. This flag, my father perished in the front, and they kissed the banner when they went to the battlefield, and I can still feel this pain. For my history, for my flag.